Free hot water from Solar PV panels! Did you know you can use your Solar PV panels to get free hot water? We often find that our clients are unable to use all of the free electricity they are generating during the day as they are out at work and don’t have many appliances running when they are not at home. When you have a Solar PV system installed, you are paid for every unit of electricity you generate whether you use it or not (this is the Feed-in Tariff, currently 14.9p/kWh). But what happens to the excess electricity when you can’t use it? It goes back into the national grid and you are paid an export tariff of 4.64p/kWh. However, this free electricity is worth more to you if you can use it because every unit you do use is one less that you are having to buy from your energy supplier. So how can you use more of your free electricity when you’re out at work all day? Well, you can now use this free electricity to heat your hot water. There are now a number of devices on the market and we recommend the Marlec Solar iBoost for domestic Solar PV systems. Solar iBoost uses ONLY energy that would be exported. It wirelessly receives information continuous from a sender device which activates the Solar iBoost to start water heating. A single battery operated radio sensor clamps around the household mains input cable so there’s no need for expensive wiring. The sender monitors the flow of electricity and transmits this information to the Solar iBoost. The Solar iBoost intelligently controls the amount of energy fed into the immersion heater using information from the sender. It adjusts the energy flow to the immersion heater as your home consumption varies ensuring that only excess power is used. There’s no need to change your immersion heater as Solar iBoost works with any normal household immersion heater rated up to 3kW. Also suitable for use with dual immersion systems. The digital display informs you how much energy has been saved both historically and in real time. The operating status is monitored and warning lights inform the user of any alerts. Solar iBoost works in harmony with your Economy 7 or 10 utility tariffs via user programmable times. A boost override switch with timed options gives the user complete control. You can download a brochure here. 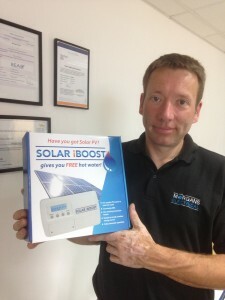 If you have a Solar PV system and would like to talk to us about the Solar iBoost, please call us on 01525 213103.